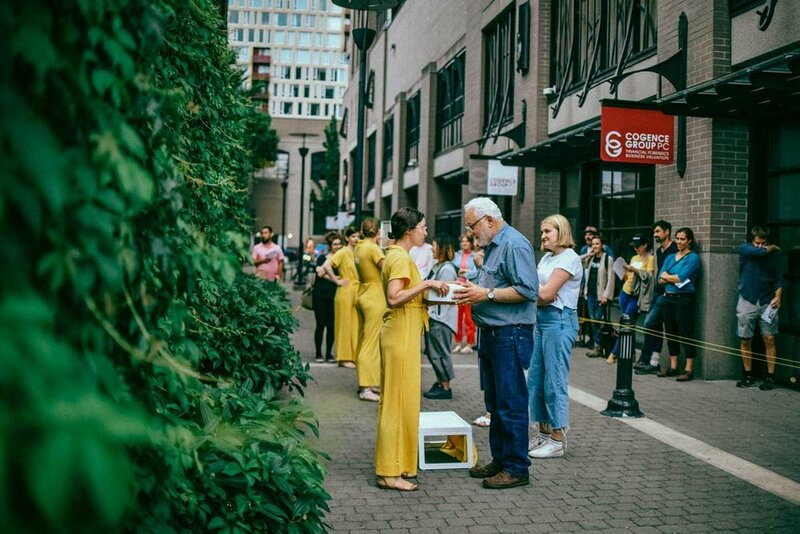 As part of Risk/Reward’s Pavement Festival, +&> teamed up with the Institute for Comedic Inquiry for a site-specific satirical performance installation in downtown Portland, Oregon. The Insecurity Screening Administration Checkpoint featured artists Laura Allcorn, Traci Sym, and Katie Shook and asked visitors to “secure an insecurity” at the TSA-style checkpoint. The entire TSA screening process is parodied. The agents shout out the rules and invite audience members to pass through the screening. Audience members are invited to whisper their insecurities into a secure receptacle that is then passed through a series of screening stations and ultimately tossing their insecurity to the wind (literally or otherwise) or securing the insecurity using our patented measures (for up to 14 hours).